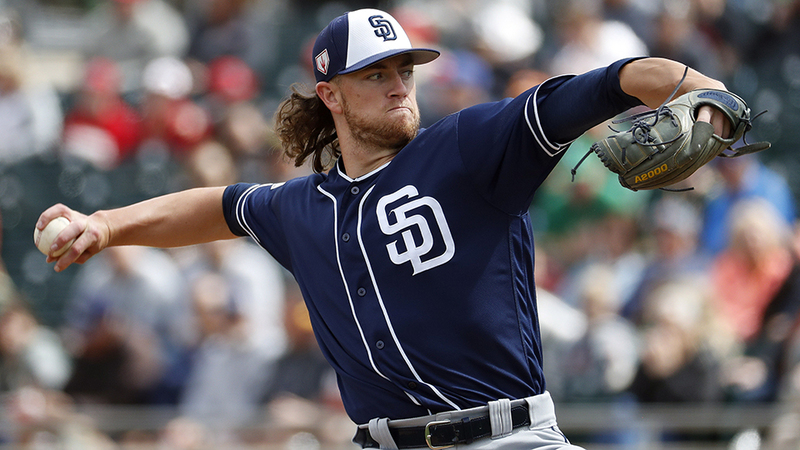 PEORIA, Ariz. -- In an already stacked pool of young pitching talent, Chris Paddack stands out. MLB.com's No. 34 overall prospect has dazzled in his first big league Spring Training and, a week left until Opening Day, he looks poised to debut in the Padres' starting rotation. Three years ago, this scenario would have been hard to imagine. In the midst of a breakout season in two Class A leagues in 2016, a torn ligament forced the then-20 year old to undergo Tommy John surgery just a few weeks after San Diego acquired him from the Marlins in a trade for closer Fernando Rodney. Paddack missed the 2017 season during recovery, but his bounce-back numbers last year were nothing short of stellar. The right-hander went 7-3 with a 2.10 ERA over 90 innings with Class A Advanced Lake Elsinore and Double-A San Antonio and although his workload was limited, his performance was dominant enough to earn an invitation to Spring Training. "It was pretty hard being a prospect and then going under the radar for 22 months where everyone kind of forget who you were," Paddack said. "That's why I was so blessed to get the opportunity to show them that I was very healthy last year and that I can pitch every five or six days. For me, that was the most important part coming off an injury. Obviously, you want to go out there and compete, but your biggest goal is to stay healthy the whole season so your body is used to that." Paddack certainly has been competing. His Cactus League line -- 2-1 with 20 strikeouts and a 2.13 ERA in four starts -- has all but penciled him into the Padres' youthful starting staff when the season opens on March 28. He could even join former top prospects Joey Lucchesi and Eric Lauer, both of whom made their Major League debuts last year, in the front of the rotation. That's a difficult feat for anyone who's had ligament replacement surgery, but those who know Paddack say it's not at all surprising. "He has confidence and talent," Padres director of player development Sam Geaney said. "The season he had was pretty special. Knowing him and getting to be around him, I'm not surprised he's made the impression that he has this spring." Chalk that up to Paddack's tenacious work ethic. In previous seasons, the right-hander relied on two pitches -- a 65-grade fastball and a 70-grade changeup. It was an unusual method, but it worked unusually well. Paddack led all Minor Leaguers who pitched at least 90 innings in WHIP (0.82) and strikeouts to walks ratio (15.0). Still, the Padres wanted a third pitch. Paddack met with pitching coach Darren Balsley during the offseason in San Diego, where the two worked together in dissecting his curveball. Balsley's advice was simple: search "Major League curveballs" on YouTube. "I advanced it to four feet in front of me. I had a net. I closed my eyes, visualized and just spun. I wasn't seeing any shape, I just closed my eyes and was feeling what was coming off of my fingers. I told myself every single curveball I threw was a strikeout. Having that inner confidence is something big for me." Paddack's curveball still isn't nearly as effective as his primary pitches, but simply having the option has been a huge boost to the his repertoire. "It's not where I want it to be yet, there's still a lot of work to be done, but it is a third weapon for me," he said. "It's something that I didn't have last year. It was more of a confidence pitch, more of a get-me-over. Now I can get outs with it. "I can throw it in bullpens, I can throw it in throwing programs, but whenever I see the action and the shape, vs. to live hitters and get swings and misses, ground balls, a first-pitch strike … all those things show that it's ready." The Padres hope he's right. They likely will begin the season with no starting pitcher older than 28. Although Paddack will still be on a limit (somewhere between 130-150 innings), baseball's top-ranked farm system has the depth to make up for it. And while the Texan may not be content with his curveball, the staff is noticing the improvement. "He came in this spring after putting in work in the offseason," manager Andy Green said. "[The curveball] is a real weapon for him. He's a guy that if you give him a challenge, he's going to keep getting better." "It's very hard to poke any holes in what he did last year, but I think there were opportunities where he didn't quite have a third pitch, and that's been the biggest thing that we've seen this year is the development of his curveball," Geaney added. "He was able to have a lot of success last year with two pitches, and now you add a third pitch and perhaps you can see the additional uptick in performance."